The 30th annual Winter Music Conference usually showcases a soundtrack that heats up the dancefloor quicker than the Miami sun and influences industry movers and shakers as much as the week itself. 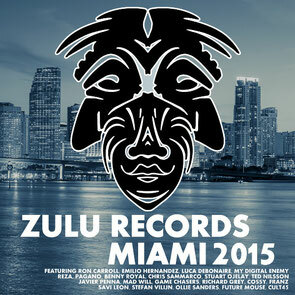 In celebration of this, Zulu Records have honoured the forthcoming WMC with another themed compilation. Zulu’s latest offering is a full 16 track EP with a selection of tracks from up and coming producers. Along with a few exclusives, there are cuts from the likes of Richard Grey, My Digital Enemy, Benny Royal, Ron Carroll, Emilio Hernandez, Cossy, Franz, Savi Leon, Ted Nilsson, Stuart Ojelay, Cult 45, Javier Penna, Chris Sammarco, Luca Debonaire, Future Mouse, Madwill, Pagano, Reza, Game Chasers and Stefan Vilijin. With ‘Romancin’ and ‘Never Stop’ hitting the DMC Buzz Chart and strong support overall from Firebeatz, Robbie Rivera, Danny Howard, Thomas Gold, Mike Vale, Junior Sanchez, D.O.N.S. and more, this should hopefully do well for the label.